Flat bars and bars are made from pure metals or alloys and are available in different types of packaging. These products are mainly used in building, the automotive industry, the electrical and electromechanical industries, electronics and white metal casting. They can be used alone to fill and/or top up tinning baths. They are also used for traditional brazing. In this case, they are combined with a flux so that the parts can be pickled before soldering. The METACONCEPT Group collects used baths, off- cuts, scraps and white metal oxides. Contact our recycling department to find out more. Dimensions and weights are always given for informational purposes only and may vary depending on the production run. Pure tin flat bars Surface treatments including tinning cookware, brassware. 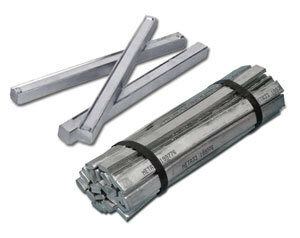 Sn60 bars Tinning and industrial, electrical and electromechanical assemblies. and Sn99,3 – Cu0,7 bars Lead-free alloys specifically for use in tinning baths for copper wires and electronic components. For feeding wave soldering machines For industrial electrical and electromechanical applications. Solder bars are generally used to fill baths for assembling parts via dipping or passing them under a wave (performed on the surface of the bath). In all cases, the parts being assembled must be pre-treated (cleaned + fluxed). The temperature of the bath must be brought to around 20°C above the liquidus temperature. The T010-type deoxidising powder traps oxides that may be present on the surface of the bath. Covering the bath with grease also helps to prevent the appearance of oxides. Flat bars can be used as described above and, more generally, in manual procedures using a propane or oxy-acetylene blow torch or a soldering iron. The parts must be brought to a temperature of around 15°C to 20°C above liquidus. Melt the filler metal onto the parts being assembled to form a regular bead. Allow the parts to cool without moving them. When the parts have returned to room temperature, brush the soldering beads using a metallic brush. If necessary, clean the assembly with fresh water or water with a touch of citric or formic acid (1 to 2 %).